When you’re focused on cleaning a difficult section, uphill or down, the last thing you need is to be battling your gear. Patagonia's lightweight, durable, superbreathable Dirt Roamers stay out of the way with a clean, minimalist aesthetic and uninhibited stretch. 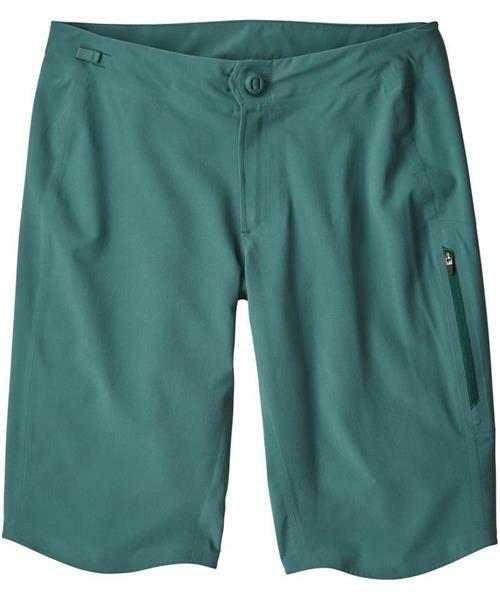 Articulated, sonically welded seams eliminate chafing and allow fluid movement even on all-day rides; the high-performance recycled polyester/spandex fabric with a DWR (durable water repellent) finish wicks moisture and dries in a flash. A curved waistband contours to your hips, and the mountain bike–specific OppoSet™ adjustable waist, along with elastic in back, customizes the fit. An 11.75" inseam covers the tops of the knees and accommodates low-profile kneepads. Interior snap loops couple with Patagonia's Endless Ride Liner Shorts and Bibs, or the liners from our Dirt Craft Bike Shorts (all sold separately). With a single zippered pocket on the left thigh.